A first of its kind, a battle of fitness, endurance, and action sports... Best of all $15,000 for the winner. 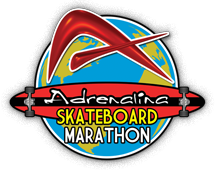 The Adrenalina Skateboard Marathon third installment was a 26.2 mile longboard race set to promote health & fitness, as well as the lifestyle that is Action Sports. The race consisted of multiple laps around a course designed to showcase different cities around the world. Cities visited in 2011 are New York City, Caguas, Plano, and Hallandale Beach. The Start/Finish line will showcase an expo village where spectators and participants can purchase the latest and greatest in action sports and beyond. There was also live music and other extreme sport demos. The festival feel allowed for spectators to be entertained throughout the day as they awaited the competitors of the skateboard marathon race. It was 29 year old Paul "Fisher Price" Kent who took first place by completing the course in 1:38:41.1. Behind Kent was New Yorker Jeff "The Wiggler" Vyain with a time of 1:39:50.1. Forty Seven year old New Yorker Enrique Cubillo finished 3rd. When it came to the ladies it was 22 year old Sara Paulshock who made it with a time of 2:06:23.6. She was followed into the podium by 22 year old Cami Best (2:15:27.4) and 19 year old Canadian Anna O'Neill (2:23:17.3). During he mini-marathon the youngest winner was a 5 year old Floridian by the name of Adrian Rodriquez who finished in the Ages 1 through 9 Division with a time of 22:51.2. Other mini-marathon winners included 11 year old Hannah Busard, 1Mac Tolan, Riley Bierbach, Oskter Tan and Thomas Tolan. The surprise of the day was that Kiefer Dixon was not fast enough to make it into the top five. He ended up finishing in 6th place with a time of 1:44:14.3. Check out Adrenalina website for complete results.